Pollen grains are rich in starch and 2-celled at the time of shedding. Moniliform refractive bodies are observed in some pollen grains. Exine develops warty projections that are spinescent (Panchaksharappa, 1966). Pollen fertility is maximum at full bloom stage and low at the beginning and the end of flowering periods (Venugopal and Parameswar, 1974). Size of pollen grains varies from 75 to 120 microns in different varieties of cardamom. Pollen grains loose their viability quickly, only 6.5 per cent remained viable upto 2 h and none after 6 h of storage (Krishnamurthy et al., 1989). Pollen fertility is comparatively lower during the early and late phases of flowering. Pollen germinates in 10 per cent sucrose solution, addition of 200 ppm boric acid improves germination and tube growth (Parameswar and Venugopal, 1974). Kuruvilla etal. 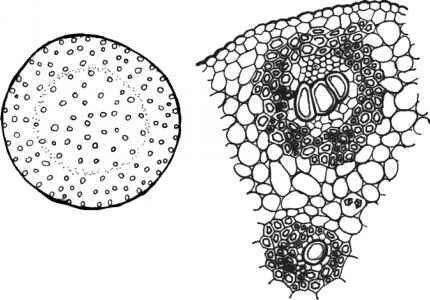 (1989) found that 15 per cent sucrose and 150 ppm boric acid favoured pollen germination and tube growth, and that the ideal temperature is 15—20 °C. Low concentration (5—10 ppm) of coconut water, GA, cycocel and ethrel enhanced pollen germination and tube growth significantly. Cardamom plants have bisexual flowers. The position of the stigma and the anthers are such that pollination does not take place by itself without the help of some external pollinating agents. Stigma is funnel shaped with cilia around a small cavity which is present on its top and is held sufficiently above the position of anther so as to eliminate the chances of pollen mass reaching the stigmatic surface in the natural course. Honeybees (Apis cerana, A. indica and A. dorsata) visit cardamom flowers during flowering season for collecting nectar and pollen and they do help in attaining over 90 per cent of pollination. The stigma remains receptive right from 4 a.m. on the day of flower opening depending upon the environmental conditions. It is reported that receptivity of stigma is highest between 8 a.m. and 12 noon (Krishnamurthy et al., 1989, Kuruvilla and Madhusoodanan, 1988). Parvathi et al. (1993) and Belavadi et al. (1998) noticed the peak receptivity around 12 noon and coincides with peak pollinator activity. Stone and Willmer (1989) carried out a detailed study on pollination of cardamom in Papua New Guinea (PNG). There the commonest foragers are Apis mellifera, and to some extent A. sapiens. A. mellifera showed a change in the foraging behaviour over time, initially collecting pollen and switching over to nectar later in the day. The foraging starts around 7 h and reached a peak around 10 h. The pollen collecting activity declined to a very low level by 12.30 h. By this time the vast majority of stigmas got pollinated. Belavadi etal. (1997) has carried out some interesting observations on cardamom flower structure and honeybee pollination. In cardamom flowers nectar is present in the corolla tube which is 23 — 2.08 mm long (range 21.48—30.4 mm), through which the style passes. The honeybees (Apis cerana and A. dorsata) despite their short tongue lengths (14.5 mm and 5.5 mm respectively) drew nectar up to 11.45 — 2.65 and 11.65 — 1.85 mm respectively. Controlled experiments using capillary tubes of similar dimensions showed that the depth of feeding by the two bee species corresponded to their tongue length when there was no style. When a style is introduced the depth of feeding increased with increase in style thickness. The presence of a style inside the corolla tube helped bees to draw more nectar from the cardamom flowers. The mean number of flowers open per day per bush is 34.5. Mean proportion of flowers per bush visited by each A. mellifera is 25 per cent, independent both of the numbers of flowers present on a plant and the time of day, hence the mean number of flowers visited is only 8.6. Pollen production per flower is reported to be 1.3 ± 0.2 mg, and this quantity gets reduced to 0.6 ± 0.2 after the visit of a bee, indicating that during the first foraging, about 50 per cent of the pollen is removed. Cardamom nectar is having pH of 7, and contains 55-100 mmol/l of glucose. The concentration of amino acids (at 8 a.m) is 3 mM. The nectar volume varied greatly over time. The initial volume, per flower at dawn was around 1.6 |l, and by 11.00 the volume increases to 209 |l. This increase is due to active secretion by the nectaries at the base of the corolla tube. After foraging by a bee, the nectar volume falls rapidly (Stone and Willmer, 1989). In one location in PNG the number of A. mellifera visiting each flower was about 31 times in a day, while in another location the average visit was only around 10.3 in a day. The fruit set in the first area was much higher than that in the second area. Bee-pollinated fruits were found to contain average of 11 seeds (Chandran etal., 1983) in South India while in PNG the average number of seeds/ capsule was 13.8. Belavadi etal. (1993, 1997, 1998), Parvathi etal. (1993), Belavadi and Parvathi (1998) have carried out detailed studies on pollination ecology and biology of cardamom in a cardamom-cropping system situation of Karnataka, India. Here the pollinator activity starts by around 7.30 in the morning and continues till 6.30 in the evening, the peak is between 11.00-13.00 h. Bees start appearing on cardamom clumps when the temperature is around 21 °C. Individual foragers of A. cerana made 4-7 trips to a single patch of flowers in a day and the number of flowers visited on each successive trip progressively increased. Individual forager visited 157-514 flowers in a day. On a clear sunny day a flower is visited as many as 120 times, on a cloudy day 57 times and a rainy day 20 times on an average. Mean number of flowers visited by a bee at a given clump is 12.32, when the mean number of flowers/clump is 30. The above workers (Belavadi etal., 1998; Belavadi and Parvarthi, 1998) also calculated the number of honeybee colonies required for effective pollination of cardamom. Based on a cardamom population of 3000 plants/ha planted at 1.8 m apart, there will be approximately 60,000 flowers available for pollination daily. Based on the pollinator activity a minimum of three colonies/ha is needed, assuming that a colony will have about 5000 foragers. They also suggested based on pollinator activity an isolation distance of 15 m for seed production gardens (Belavadi etal., 1993). The fruit is globose or ellipsoid, thin walled, smooth or with longitudinal ridges when ripe. Varietal variations have been noticed in fruit shape. The fruit colour is green and turn golden yellow on ripening. Seeds are white when unripe and turn to brown on ageing and become black on maturity and their numbers per capsule vary between 10-20 in different genotypes. A thin mucilaginous membrane (aril) covers the seeds. The extent of fruit set is highest when the atmospheric humidity is very high in the cardamom tract and the setting is scanty in summer months even under irrigated condition. In general, fruit set percentage is high in young plants and when the plants surpass the economic life span, the fruit setting declines to 50 per cent or even less. How to pollinate large cardamom?